ST. PETERSBURG, April 12. /TASS/. Russia’s sole aircraft carrier Admiral Kuznetsov is expected to join the Russian Navy after repairs in 2021, Deputy Defense Minister Yuri Borisov said on Thursday. "The aircraft carrier will undergo repairs and the replacement of all boilers and equipment. There is an agreement with shipbuilders on completing the repairs in 2020 and in 2021 the warship is due to return to the fleet," the deputy defense minister said. 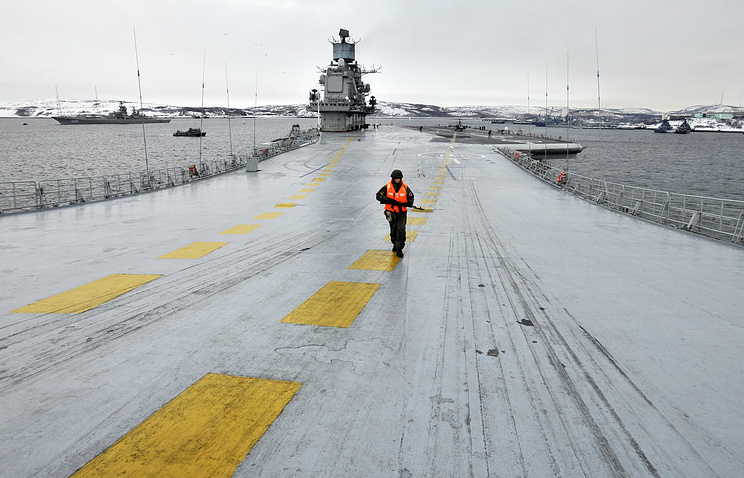 The Admiral Kuznetsov will be repaired at the 35th Ship Repairing Yard in Murmansk in northwest Russia (a branch of the Zvyozdochka Ship-Repairing Center). The Admiral Kuznetsov is Russia’s sole aircraft carrier. It was floated out in 1985 and it entered service in 1990. The warship is 305 meters long and its flight deck is 72 meters wide. The aircraft carrier has a water displacement of 59,000 tonnes. The aircraft carrier is armed with Granit cruise missiles based in 12 inclined launchers under the deck. The warship can carry up to 30 MiG-29K/KUB and Su-33 fighter jets, and also Ka-52K attack helicopters and Ka-27 and Ka-29 anti-submarine warfare choppers. During its voyage in the Mediterranean Sea in 2016, the aircraft carrier Admiral Kuznetsov took part in the Russian Aerospace Force’s operation in Syria. At that time, the pilots of deck-based aircraft performed 420 sorties (117 at night), destroying over a thousand of terrorists’ facilities.